Students from Kushindokai Karate and Fitness travelled to Kitchener on Saturday, May 5, to compete in the Karate Maynia Tournament. Fourteenn students made the trip to the even at the Kitchener Memorial Auditorium. 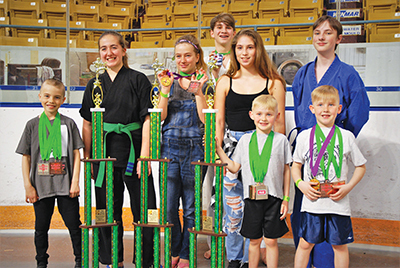 Sisters Sarah, 7, and Lauren, 10, Embree placed second and third respectively in their kata divisions, while brothers Owen, 11, and Luka, 7, Bailey-Braun both placed fifth in their kata divisions. Hugh Phillpott, 10, competed in kata and sparring, placing fourth in kata and fifth in sparring. The Barrett brothers, Coen and Quentin, both competed in four different divisions. Coen, 6, came first in creative weapons, second in kata and traditional weapons, and thrd in sparring. Quentin, 7, placed third in both creative traditional weapons. Ayden Cappuccitti, 8, who also entered four divisions, placed second in creative weapons, sparring, and kata, and third in traditional weapons. Izabella Dwyer, 12, placed fourth for her kata performance, while her sister Emma, 14, won her kata division with top marks. Himanshu Dursun, 16, came thrd in his kata group and Elias Tsilimidos, 14, won first in kata and second in sparring. Carley Spiteri, 14, and Isaac Phillips, 14, both had strong showings in their advanced divisions in kata and sparring but failed to place in the top four.